Meenakshi Temple, India, Goddess Meenakshi, Madurai, South India Travel Package. The Meenakshi Temple is nearly 2000 years old and is situated in the city of Madurai, Tamil Nadu. It is a splendid example of Dravidian style of temple architecture. 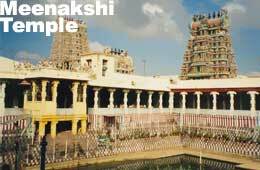 The Meenakshi Temple complex is dedicated to Shiva and his consort Parvati known here as Sundareswarar and Meenakshi. Kulasekara Pandya built the original temple but the entire credit for making the temple as splendid as it is today goes to the Nayaks. The temple as it stands today, was designed in 1560 AD by Vishwanatha Nayak and subsequently built during the reign of Thirumalai Nayak. The Nayaks ruled Madurai from the 16th to the 18th century AD. Meenakshi and Sundareswarar are regarded as the Royal Pandya rulers of Madurai. Meenakshi's father is said to be Malayadwaja Pandyan, who was preceded by Kulasekhara Pandyan, the legendary builder of the city of Madurai. The Sri Meenakshi Sundareswarar temple and Madurai city originated together. According to legends, Madurai is the actual site where the wedding between Shiva and Meenakshi took place. According to a mythical tradition, Indra once committed sin by killing a demon, who was performing penance. He could find no relief from remorse in his own kingdom so he came down to earth. While passing through a forest of Kadamba trees in Pandya land, he felt relieved of his burden. His attendants told him that there was a Shivalinga under a Kadamba tree beside a lake. Indra was certain that the linga had helped him and so he worshipped it and built a small temple around it. It is believed that it is this linga, which is still under worship in the Madurai temple. The shrine is called the "Indra Vimana". The temple complex is within a high-walled enclosure. There are two sanctums one for Meenakshi and the other for Sundareswarar, surrounded by a number of smaller shrines and thousand pillared halls. The temple has 12 impressive gopuras. The soaring towers of granite rise from solid granite bases and are covered with stucco figures of deities, mythical animals and monsters painted in vivid colors. The soaring and exquisitely carved towers that enclose the temple are dedicated to Meenakshi. The south gateway contains the twin temples of Shiva and Meenakshi and is about nine storeys high. The four tallest gopuras stand on the massive outer walls of the temple, one on each side. The Southern gopuram is the tallest one and the only one that may be climbed. From atop this 60 ft high gopuram, one gets a complete view of the other gopuras as well as the two vimanas. Each of these gopuras is filled with countless stucco images portraying legends from the Puranas. A visitor entering the temple through the eastern gateway first enters the Astha Shakti Mandapam (Hall). It was built by Thirumalai Nayakar's wives Rudrapathi Ammal and Tholimamai. The Meenakshi Nayak Mandapam is next to this hall. It is a spacious columned hall, which was once used for shops and stores. This hall has a votive lamp-holder with 1,008 lamps, which are lit on festive occasions. The sculptures on the pillars depict some of Lord Shiva's Thiruvilayadals (miracles) and the stories related to Meenakshi's birth and her life as the princess of Madurai. Meenakshi Nayakkar Mandapam is a big hall adjacent to Astha Shakthi Mandapam. It consists of 110 pillars carrying the figures of a peculiar animal with a lion's body and an elephant's head called Yalli. Potramaraikula or the Golden Lotus Tank is an ancient temple tank where the devotees take bath in the holy water. The area around this tank was the meeting place of the Tamil Sangam, the ancient academy of poets. A pillared corridor surrounds the tank. Steps lead down to the tank, enabling worshippers to take bathe in it. The Oonjal (swing) Mandapam and Killikoontu (parrot cage) Mandapam are on the western side of the tank. On every Friday, the golden idols of Meenakshi and Sundareswarar are seated on the swing in the Oonjal Mandapam and hymns are sung as the deities are swung. The parrots in the Kilikoontu Mandapam have been trained to repeat Meenakshi's name. But more interesting are the 28 pillars of the mandapam, which exhibit some excellent sculptures from Hindu mythology. The idol of Vinayak was unearthed by the king Thirumalai Nayaka when he excavated a temple tank 3 km from the temple and erected it here. In the corridor outside the main shrine, there is stump of the kadamba tree. It is said to be a part of the same tree under which Indra worshipped as Shiva linga. The outer corridor also has the Kadambathadi Mandapam and the Velli Ambalam or the Silver Hall. An idol of Nataraja, Dancing Shiva, covered with silver leaves can be seen. This idol of Nataraja is covered with silver leaves. The Thousand Pillar Mandapam is the 'Wonder of the Palace'. The actual number of pillars is 985 only. They are beautifully decorated and sculpted columns. The Thousand Pillared Hall houses the Temple Art Museum where one can see icons, photographs, drawings, etc., exhibiting the 1200 years old history. Just outside the hall, towards the west, are the Musical Pillars. Each pillar when stuck produces a different musical note. The Kalyana Mandapam is to the south of the Pillared Hall. It is here the marriage of Shiva and Parvati is celebrated every year during the Chitirai Festival in mid- April. Thirumalai Nayakkar built Vasantha Mandapam. Vasanthosavam, the Spring Festival is celebrated in this mandapam in Baisakhi (April/May). Its pillars contain elaborate sculptures of Shiva, Meenakshi, and scenes from their wedding as well as the figures of ten of the Nayak Kings and their consorts. This is also called Pudhu Mandapam. The most amazing characteristic of this temple is the fact that it is a living legend, continuously following traditions for over two millennia. In its finished form, it represents the miraculous resilience of the Indian cultural ethos. Legends such as Meenakshi Kalyanam, the coronation of Meenakshi and Sundareswarar as the Queen and King of Madurai still form part of the grand festival traditions of the temple. It is complimented with architectural and sculptural splendor due to the vision and patronage of the Madurai Nayak rulers.